I am linking up with Gussy Sews Inspiration Workshop and the prompt this week is Favorite Recipe. This may be an older post, but it's definitely a favorite! 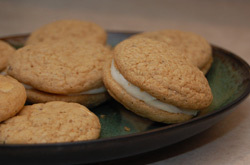 These cookies were inspired by a latte. You see, we were at Mariposa Bakery (again on our Boston trip) ordering sandwiches, when I spotted a sign promoting their London Fog - an Earl Grey latte with vanilla syrup. Being a recent Earl Grey lover, and always a vanilla fan, this latte had my name on it. Unfortunately, I hesitated, and the chance to order it was lost. The craving, however, was not. I started dreaming about this latte, but no longer as a latte, rather as a cookie. 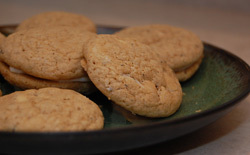 Then Twitter started filling up with reports of Earl Grey cookies. My mouth drooled. I started dreaming of what my perfect London Fog cookie would be: soft, full of vanilla, delicately flavored with Earl Grey, syncopated with vanilla chips, filled with smooth frosting to communicate the essence of frothed milk. And so it was. 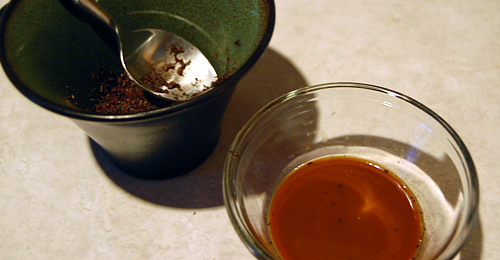 The photo below shows the process for getting the 4 Tablespoons of concentrated tea. I put 6 teabags' worth of Earl Grey in a mug with 1/4 c. hot water and let it steep. The leaves expand as it steeps, so use a spoon to compress the leaves so the liquid can pour out. I put in 4 T. of this concentrated tea into the cookies, but feel free to use more if you want a less "foggy" Earl Grey flavor. Don't worry if some leaves sneak in with the liquid; they give the cookies their slight speckle. As a side note, do you know what gives Earl Grey its unique flavor? It's oil extracted from the rind of a bergamot orange. This was news to me ... hope it hasn't spoiled the mystery for you! For a more dramatic presentation, you could top the cookies with the cream cheese filling and sprinkle some orange peel shavings on top. It would make a great addition at your next tea party! That being said, the cream cheese filling is somewhat optional. 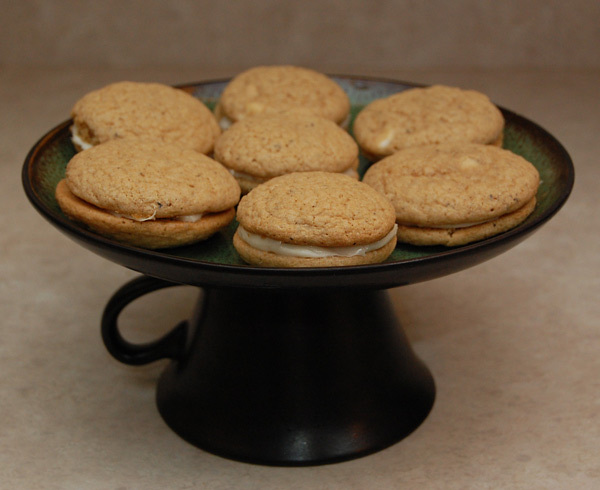 The cookies are tasty enough to stand on their own, so I left some of them unfilled for when I wanted a lighter treat. Sometimes, though, you need to go all out. I mean, seriously, doesn't everything taste better with cream cheese frosting? Now for the moment you've all been waiting for: the recipe. 2. Empty 6 tea bags into a mug and stir in 1/4 c. water. Set aside. 3. In a separate small mixing bowl mix flour, baking soda and salt. 4. Beat shortening and sugar until fluffy. Add 4 T. tea, vanilla, and eggs; mix well. 5. In a separate bowl, mix flour, soda, and salt. Add to shortening mixture. Fold in vanilla chips. 6. Drop dough by teaspoonfuls onto a greased cookie sheet. Roll dough into balls for most even results. Oh my goodness, these look so good. I've not heard of Earl Gray cookies, but I love the tea.